If you’re looking to make a change without the downtime of plastic surgery, I offer many non-surgical body contouring options at my Las Vegas practice. Which one is right for you and your body? Here is a quick-and-easy guide to help you understand the available options and how they can help you achieve your goals. KYBELLA® is an injectable treatment that reduces fat under the chin gradually. KYBELLA contains deoxycholic acid, which is naturally present in your body and metabolizes fat cells. Patients will usually need 2 to 6 treatments spaced at least a month apart to reach their desired look. Thermi® technologies use radiofrequency (RF) energy to firm and tighten skin by renewing the production of collagen through gentle heating. The Thermi system emits and continuously monitors the level of RF energy either on the surface of this skin or just beneath the surface, depending on the treatment. ThermiSmooth can be used to tighten skin on the face and body. ThermiVa® can tighten vaginal tissues and reduce vaginal dryness. ThermiBreast® can lift and reshape breast tissue. CoolSculpting® may be right for you if you have minor problem areas of fat and don’t want to have the recovery time required with traditional liposuction. CoolSculpting can be used to treat unwanted fat on the abdomen, back, or flanks. The CoolSculpting applicator cup uses gentle vacuum pressure to draw the tissue between the cooling panels. This technology extracts energy (cooling) from the underlying fat tissue, with no impact on the other tissues. Cellulaze™ is a minimally invasive laser treatment that targets all 3 causes of cellulite: enlarged fat cells, fibrous bands of tissue that pull down on the skin, and thin, inelastic skin that makes the lumps and bumps more visible. The laser smooths protruding fat cells by liquefying the fat. It also releases the connective tissue that causes dimpling and promotes the production of collagen in your skin to improve thickness and elasticity. Laser treatments are ideal for those with moderate to deep wrinkles, scars, pigmentation irregularities, or skin laxity who do not want or need facelift surgery. The Ultrapulse CO2 laser is among the most versatile fractionated lasers, as it allows for a wide range of resurfacing options, including spot treatments, skin tightening, scar improvement, and comprehensive skin rejuvenation. 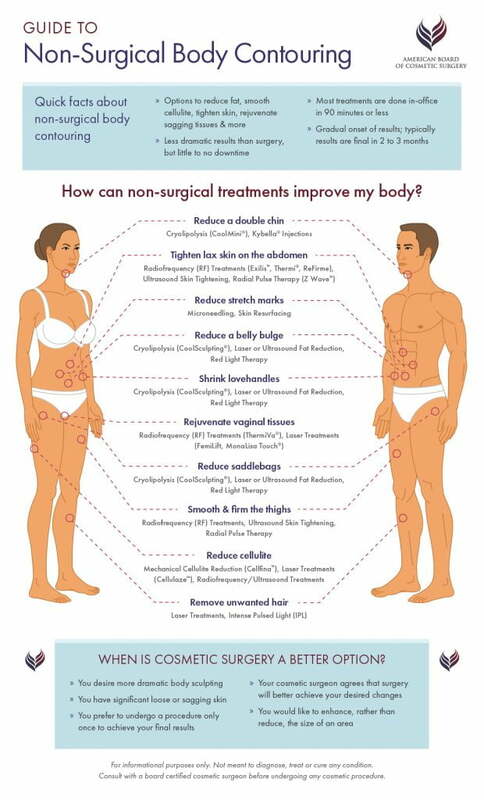 To review your non-surgical body contouring options and find out which one is right for you, request a complimentary consultation at my office in Las Vegas or Henderson, NV.